Every day, we produce contaminants and air pollutants. These include dander, dust, chemicals, and allergens. Even in a small, six-room house, up to 40 pounds of dust is created each year. Where do you think all of this dust goes? Because the HVAC system circulates air throughout the home, much of this dust winds up in your air ducts. That’s why air duct cleaning is such an important task. You’ll find that when a home has clean air ducts, the HVAC system doesn’t have to work as hard to maintain a steady temperature. Not only will you and your family be happier and more comfortable, but your energy bills will be lower all year round, too. That is why air duct cleaning is the one maintenance task you simply shouldn’t be overlooking. Get in touch with the experts at Cote’s Mechanical and let us show you the many benefits of cleaning your system on a regular basis. Many companies that offer air duct cleaning don’t do a thorough job. 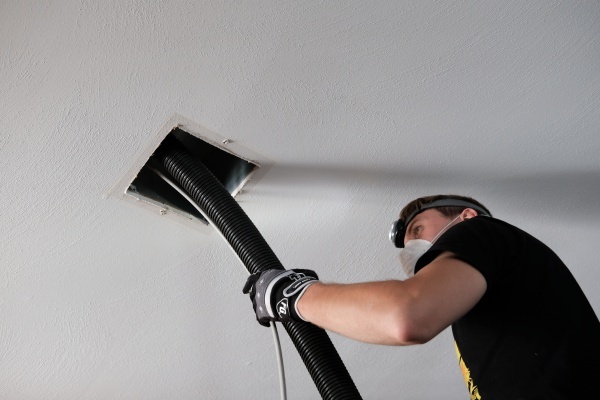 They may be able to clean your air ducts on the surface, but because they are not HVAC specialists, they cannot get deep down and clean your ducts thoroughly. You should always go with a NATE-certified HVAC company for your air duct cleanings. Trust the experts at Cote’s Mechanical to tackle your ductwork cleaning needs. Not only will we do the job well, but we can also spot problems with your ducts that need to be addressed before they get worse. Unexplained spikes in your utility bills. When you’re paying more than you expect for heating or cooling, it could be that dust or debris has built up in the air ducts. Having your ductwork cleaned is a simple way to lower your utility bills. Pest problem. If you have battled a pest problem and won, having your ductwork cleaned is a good way to finish the battle. Dirt around vents. If your vents are blowing dirt or dust, it’s probably time to have your ductwork cleaned. Respiratory problems. When you or anyone in your home has unexplained respiratory problems, having your ductwork cleaned is one simple step to try to resolve them. Visible mold growth. This is another sign that something is wrong in the ductwork. Luckily, it’s not something that the air duct experts at Cote’s Mechanical can’t take care of. Improved air quality – The air you and your family breathe will be cleaner, clearer, and fresher. Lower energy costs – You’ll see a decrease in your energy bill each month. Better air flow – Your A/C and heat will run smoother and harder, making it easier to stay comfortable in your home. A cleaner home – You’ll likely see less dust around your house, plus there may be less dirt and debris in the floor as well. This means less work for you. If you’d like more information about air duct cleaning and how it can benefit your home, contact us today. We look forward to helping you breathe better and feel more comfortable in your home.